1. CD with Reports for EC National Conference – I know that for many the word denomination is a really long four-letter word. Maybe you’ve had a bad experience with the institutional nature of the church. Maybe you’re a part of a denomination that you’re not proud of. Maybe you question that denomination pretty much equals disunity. Maybe you have another reason for not feeling so happy about a specific denomination or even the idea of denominations. If any of those “maybes” speak to you, I don’t blame you. A lot of junk has happened in the name of denominationalism. Junk happens in mine too. But I also want to share that I love my denomination, the Evangelical Congregational Church. Well, except how long of a name it is. When we changed our church sign a few years ago, people asked me how our church handled it when we changed our name. I said “Great!” Because we didn’t actually change our name. Saying “Faith Evangelical Congregational Church” is such a mouthful, that amongst ourselves we have always shortened it to “Faith Church”. Our byline on the sign still says, “an Evangelical Congregational Church”. We’re thankful to the Lord for our denomination. We were planted by the EC Church in the late 1960s, and we are proud to be a member of the EC Church. Every year in May delegates from all EC local churches gather for a national conference, something I come away from every year inspired and excited about what God is doing. Some years more than others! Like I said, the EC Church isn’t perfect, but it is passionate about the mission of God’s Kingdom. Take a look for yourself at the EC Church website, and you’ll see what I mean. So today I popped the CD in my laptop and read most of the reports of what God is doing in and through the EC Church. It is exciting! I can’t wait for conference to hear more, to connect with friends, and be inspired to worship and serve the Lord. I love conference. 2. Mission Drift & The Searchers – These are two books given to me that I recently read. My father-in-law gave me The Searchers: A Quest for Faith in the Valley of Doubt by Joseph LaConte, a book intended for those who are, as the title suggests, searching for the meaning of life. If you are reading this and not a religious person, maybe searching, maybe not, would you do me a favor and read the book? I’d be interested in your feedback. Personally, while it included some good stories, I was only so-so about it. But that’s me. Maybe some other people would have a different opinion. The other book was given by a friend from church, Jonathan, as his brother, Chris, is the co-author, along with Peter Greer, both of HOPE International, an organization doing amazing work in the area of micro-finance. 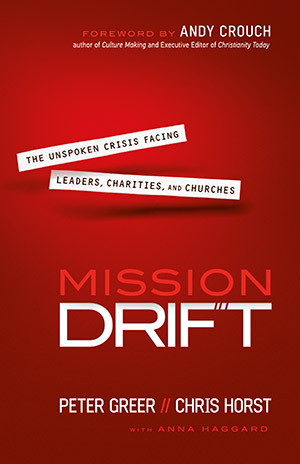 I thought Mission Drift: The Unspoken Crisis Facing Leaders, Charities, and Churches was excellent. I just saw Jonathan at the church a few minutes ago, and told him that while it is the accessible kind of book that a person could read through in a couple days, Chris & Peter loaded it with so much thoughtful and applicable material that I can see it having a lasting impact for years. I copied the chapter on board members and gave it to Faith Church’s Ministry Council at our strategic planning meeting this past Saturday. Though the book is written primarily for non-profit Christian organizations, its principles are broadly applicable to churches, and leaders of all kinds. 3. CEF Mug and brochure – Because our church sponsors a Good News Club (GNC) at our local elementary school, and because CEF (Child Evangelism Fellowship) oversees GNCs all over our county, some of our people went to CEFs 70th anniversary banquet over the weekend. They brought me back a mug and brochure from the evening. At home our coffee mug cupboard is packed, so I think I’ll put this one in the church kitchen. A couple weeks ago we finished our spring session of Good News Club at Smoketown Elementary. I’m very grateful for all the volunteers from our church, and a couple from other area churches, that work hard to run GNC. 7 weeks in the fall and 7 in the spring. About 40 kids participate, and it has been wonderful to see God at work in their lives. Now it’s time to clean up this mess!